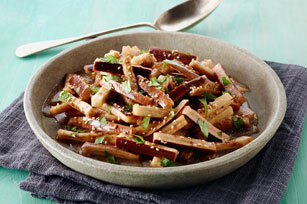 Steam eggplant in bamboo or metal steamer on high heat 12 min. Remove from heat; cool. Transfer eggplant to large bowl. Add dressing; toss to coat. Cook sesame seed in skillet on medium heat 3 to 5 min. or until golden brown, stirring frequently. Garnish with chopped fresh coriander (cilantro) just before serving. Here's a tasty way to enjoy eggplant. And as a bonus, this easy-to-make recipe can be part of a healthy eating plan.